The shadows of Venice have long inspired writers—from Henry James and Thomas Mann to Daphne DuMaurier and Ian McEwan. 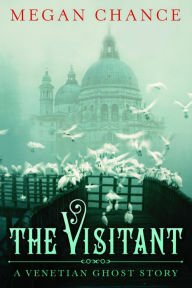 Now, its Megan Chance’s turn, as the acclaimed novelist takes readers through the alleys and canals of this ageless and mysterious city in her compelling new book, The Visitant: A Venetian Ghost Story (Lake Union Publishing; September 22, 2015). Part haunted tale, part love story, part mystery, this riveting historical novel explores the truth behind a terrifying reality, as a young American woman, immersed in a strange foreign culture, encounters a world beyond her wildest imaginings. Buried secrets of a tragic past converge, threatening to destroy not just her hopes of redemption, but her very life. Set in 1884, The Visitant paints an unforgettable portrait of a decaying city and the secrets that lurk in its dark, crumbling corners. Elena Spira has arrived there to take up the duties of nurse to a young epileptic man who has descended to the depths both physically and psychologically. Samuel Farber wants none of Elena’s help as he wallows in a laudanum-triggered haze of hallucinations. Samuel speaks of visits from a spirit, seemingly wild claims that Elena first rejects as drug-fueled. But, the truth is far more sinister. When Samuel’s best friend and host, Nero Basilio, arrives, Elena finds herself drawn to this charming man as he shows her the hidden delights of Venice. But there are dark forces at play—forces that Elena cannot begin to comprehend. Casa Basilio possesses a tragic history, and a ghost whose presence may be driving Samuel to madness. 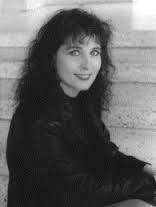 Megan Chance is a critically acclaimed, award-winning author of historical fiction, including Inamorata, Bone River, and City of Ash. 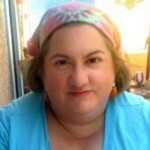 Her novels have been chosen for the Borders Original Voices and Book Sense programs. A former television news photographer and graduate of Western Washington University, Chance lives in the Pacific Northwest with her husband and two daughters. From the moment I opened this book (well, the file on my Kindle) and joined Elena on her journey, I was hooked on this story. It’s the perfect blend of moody, mouldering castle descriptions, historical thriller, and romance, with just enough of the supernatural to make you kind of glad all the rooms in Casa Basilio are dimly lit, so you can’t tell what’s lurking in the corners. Elena, the nurse sent to care for a family benefactor’s son, is both strong and feminine. She isn’t afraid to exert her rightful authority, but she also isn’t so impulsive as to leap without looking, and I really liked this about her, because when love finally entered her sphere, it did so in a way I found really organic and believable. Similarly the characters of Nero and Samuel are both rich and textured. I particularly liked the way author Megan Chance gave the latter epilepsy, and then kept his illness within the context of late nineteenth-century Venice. Gulia, Zuan, and Madame were all complex and interesting characters as well, and then of course, there’s Laura, who exists as a ghost, a memory, a fever dream, and is absolutely a character in her own right. Chance’s deft handiwork keeps this novel moody and atmospheric, but the plot never feels slow or plodding. Like the decay creeping over the huge house, the story is nuanced, here poking into one crack, there washing over another. I liked the use of language, not just the specific word choices the author made, but also the fact that Elena doesn’t speak Italian, and has to get by in English (she’s American) or French. Adding that communication barrier adds to Elena’s isolation and confusion, and enhances the mood for the reader. Overall, I found this novel rich with description, pouring with plot, and a great psychological exercise. Which is scarier: the kind of ghost that exists as a metaphysical being, or the kind that is conjured by our own unresolved emotions: guilt, grief, loss? 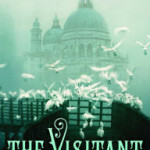 Read The Visitant: A Venetian Ghost Story to make that determination for yourself. Goes well with strong cheese, fresh bread, and a hearty bowl of minestrone soup, the latter of which isn’t mentioned in the book, but everything was so dismal and damp that, trust me, it’s in order. TO ENTER: Leave a comment answering this question: Do you believe in ghosts? Why or why not? Alternatively, you can tweet about this review, just make sure you tag me (@Melysse) when you do. Contest open until 11:59 PM CDT on Wednesday, October 14, 2015.